Guar gum powder has a variety of applications in different industries. In the food industry, it is been used as an emulsifier, binder, thickener, stabilizer etc. and also thickens the dye solutions in the textile industry. Along with this, there is also a wide array of applications of guar gum powder in industries. There is a remarkable growth of guar gum powder in the coming years as there is high demand for convenience food according to the changing habits of the people. According to the study, the oil drilling industry represents with the largest end user of guar gum powder and then followed by other industries like the food industry, textile & paper industry, pharmaceutical and cosmetic. In the market of guar gum, United States is the largest consumer, followed by Germany and India. The key factors that are responsible for the demand for guar gum powder depend upon the processing and manufacturing requirements, project cost & economics profit margins, etc. Nowadays, there is a rise in multiple uses in confection, pet food, beverages, and baked food products. So will be the demand of the guar gum powder as it is been used in different food as thickener, stabilizer etc. Quality is the important factor for the product especially when it is been used in the food industry. Slight contamination may lead to serious consequence with the product. The productivity of the guar gum powder should be of high quality as the low-quality inputs affect the soil and output. As the guar gum is been subjective to its size, color and shape farmers should be aware of the varieties that suit to get a better quality guar gum. The study shows that India and Pakistan are the leaders in producing guar gum derivative due to its suitable climatic conditions. Other countries like South Africa, Brazil, Sudan etc. also shows with the successful growth of the guar gum. However, guar gum powder has been directed more toward the oil drilling industry. It now forms a bulk demand of guar gum. It has reached up to 70 % of the total production of guar gum powder. The remaining percentage is taken up with other industries like food, textile, pharmaceutical, cosmetic etc. 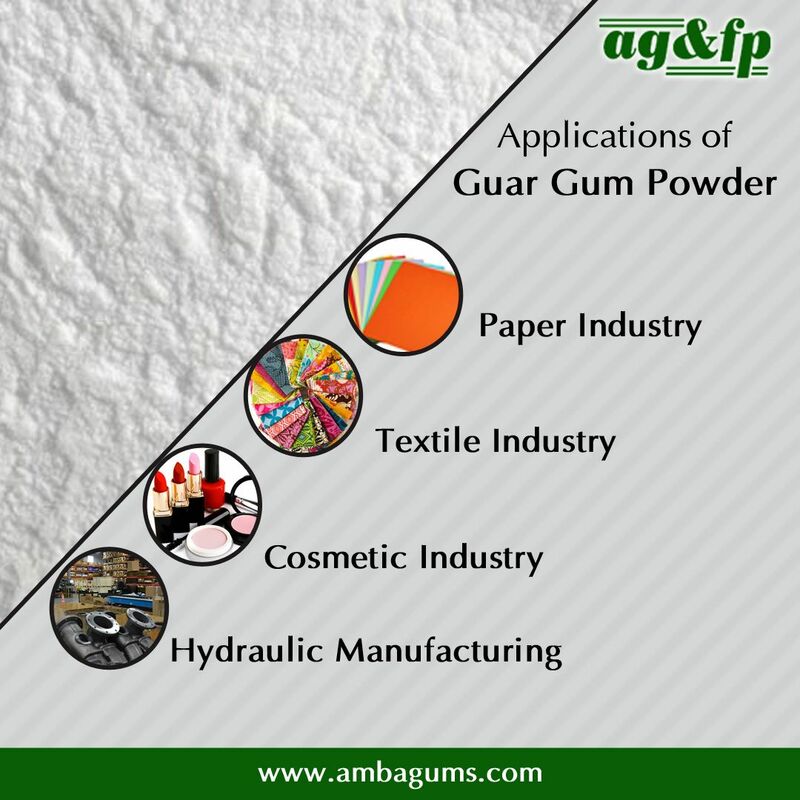 With the wide range of applications of guar gum powder in different industries Amba gums & feeds products provides with the high-quality gum powder. We ensure with the germ-free production of guar gum powder that maintains that helps to maintain the quality and service in the production. Our other products include guar gum split, guar meal, cassia gum powder, and fast hydration gum powder. For more information contact us today and know about other application of guar gum powder and its demand in the industry.